Democrat (Term Expires: 2022) serving Allegheny (part) County. 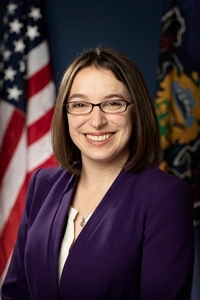 Senator Lindsey M. Williams represents the 38th Senatorial District in Allegheny County, which encompasses the 11th and 12th Wards of the City of Pittsburgh, the North Hills suburbs, and many of the communities along the Allegheny River Valley. Lindsey has spent her career fighting for working families. Following her graduation from Duquesne University School of Law, she took a position as the Director of Advocacy at the National Whistleblowers Center, where she worked to promote the passage of bipartisan legislation that protected whistleblowers for reporting waste, fraud, and abuse. However, when Lindsey attempted to form a staff union with her coworkers to protect their rights, she was illegally terminated, she took her case to the National Labor Relations Board and, after two years of litigation, successfully resolved her claim. Following her illegal termination, Lindsey went on to work for the International Brotherhood of Teamsters and the Pittsburgh Federation of Teachers prior to her election to the state Senate in 2018. Lindsey was raised in a union household, and her parents stressed hard work and education through both words and actions. Her father Jack was a member of Operating Engineers Local 542 for 40 years. Her mother Nancy worked with a temporary service company when Lindsey and her sister Caitlyn were school-aged and later took a job as an accounts receivable clerk at a local company. When her job was eliminated and relocated to India, Nancy was able to take advantage of education incentives with her unemployment benefits and finished her college degree in May 2014, more than 15 years after starting her education. As a state Senator, Lindsey’s top priority is serving the constituents of the 38th District through offering one-on-one assistance in her District Office, hosting community events to connect residents with area services, and supporting local organizations and projects. She is also committed to fighting for family-sustaining, union jobs; fully-funded education for all students; and access to quality, affordable healthcare for all Pennsylvanians. Lindsey has been named Minority Chair of the Senate Veterans Affairs & Emergency Preparedness Committee for the 2019-2020 legislative session, in addition to serving on the Communications & Technology, Education, Labor & Industry, and State Government Committees.